So why poems and why are they talking? However, the idea was there. I thought it would be neat to write a small collection of poems about language and how we speak. The first poem, Difficulty Speaking, was written for a college course and got an A+ (*ahem*). I thought if I was going to try and write a collection of poetry (something I haven’t really done before, though I’ve written a lot of poetry, I don’t usually put it out there), I would focus on that style. This would accomplish two things: it would get me off my lazy behind and write (at the time it had been a few weeks since I had written anything) and it would get me writing with a goal (I work best with a deadline, I guess). So I wrote ten poems and called it done. The collection itself had its own ideas, however. I went on to write five more poems to round the whole thing out. So that’s pretty cool. The real and the fantasy would have one main link: I wanted to examine language in different ways. 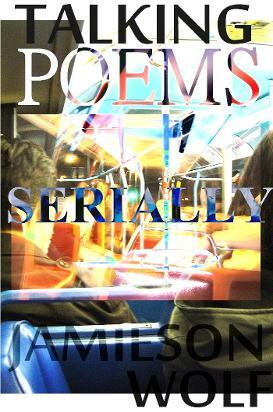 Some poems in this collection are actual conversations or dialogue’s caught on paper. They happened as they are written; I just tried to capture them. Others, more obviously, are made up, but each poem looks at what we say and what we do not say. I tried to let the conversations stand out a bit. I wanted to examine how we talk to each other. As I listened and wrote, I experimented with the form of a poem itself. If language was going to be a focus to the poems, I also wanted to play around with the page, the space and the words. I had fun-I hope you did, too. If the poems are a little loud, I’m sorry about that. I talk enough for three people. You can also download the current edition of Talking Poems via Amazon .ca, .com or .co.uk. The eBook is $0.99 and will be updated once this project is final. The eBook can be read on your Kindles or on your Amazon compatible device with apps such as your iPhone, iPad, iPod Touch, Android Devices, etc. Talking Serially will be available on my web site at www.jamiesonwolf.com I had considered a few other ways to try this, but figured, why not just stay home? I hope you enjoy this serial poetry experiment. This poem is available to you for free in .mobi, .pdf and .epub formats. I hope you enjoy them. In whichever way you read them, be it serially, online or in eBook format, I hope you enjoy them.